This month’s fruit in full season are pears. Delicious, good for you and a whole lot of nutrition in a sweet juicy package.A good source of vitamin C, fiber and only 100 calories (raw) per serving. Sodium free, fat free, and cholesterol free. This particular variety I used for this recipe was the Concorde pear,they’re a golden yellow, green colour and great for any type of cooking and baking. They’re firm in texture with a delicate vanilla taste. When cut they don’t turn brown so are great added to fresh salads and when cooked at high temperatures don’t disintegrate into a sugary mass. Place the butter in an oven proof non-stick frypan (13cm) over medium heat until melted. Add the golden syrup or maple syrup, arrange the thinly sliced pear and prunes in the base of the pan and cook for 5/6 minutes or until soft. Remove from heat. Use the lid of the frypan as a template to cut the circle of puff pastry to fit inside the pan, place over the pears and prunes. Bake the tarte for 30/35 minutes until the puff pastry is golden. Invert the tarte onto a serving plate and ooohhh! It’s a beauty! Serve with a scoop of vanilla ice-cream if it lasts that long.. or just on it’s own is fine! Tuesdays is a fun day sharing recipes with friends linked up to Tasty Tuesdays with Alicia at A Beautiful Mess and Jen at Balancing Beauty and Bedlam. Join us sharing your favourite recipes. Oh it does look very good. This book was packed into my luggage first regardless of weight on one of my travels…I know I look at this book often, love the photo’s and the recipes..and yes a great treasure! 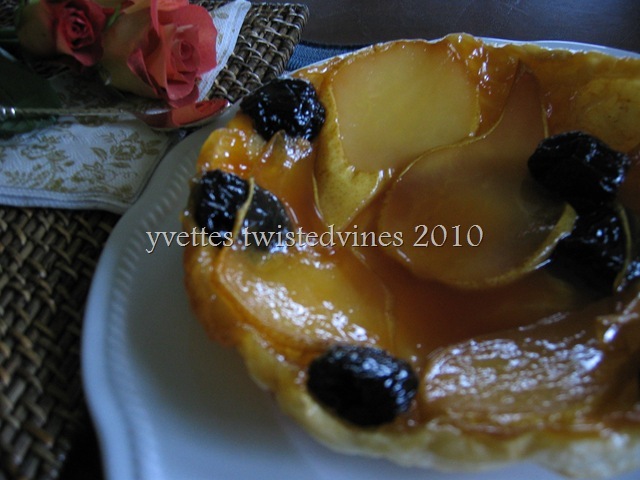 Oh Yvette, what a fun and pretty tarte tatin and so easy! I am really looking forward to making this! Thank you. I was so surprised at the outcome, really simple and delicious, I guess any combination of stone fruits would work fine! Simple and delicious recipes…a real treasure I agree! Beautiful! I love the combination of pears and prunes. thanks so much. A great tasty combination…the pears are nearly transparant in this syrupy sauce.One to try for sure! What a spectacular dessert and it actually seems fairly easy to do. Thanks for calling by, believe me time management is important to me..this is a breeze! My mouth is watering, Yvette. I’ll have a generous slice and a cup of coffee, please. Ice cream scoop optional. It looks divine all by itself! I like the recipe. It does seem easy to do. Thank you for sharing this fabulous dessert and your lovely autumn decorations. Oh, I hope you’ll be able to try this, it’s simple and easy! Thanks for calling by! “A delicious mouthful of syrupy sweet pear and prunes on a delicate crust of puff pastry, light and flaky…” How can anyone say no to thatt?? 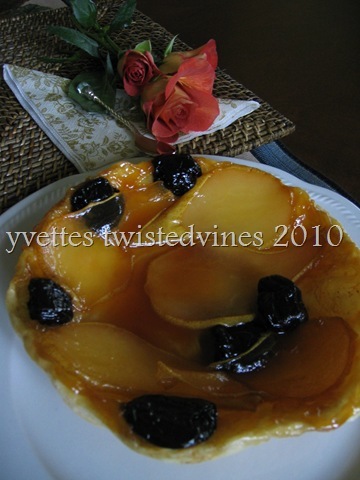 what a gorgeous tarte tartin! 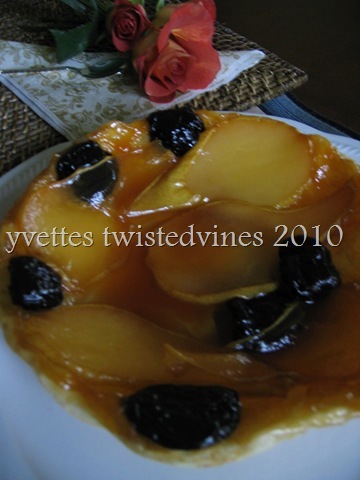 So happy you called by….yes, it’s easy, I was surprised myself, I love trying new recipes and this was the first tarte tartin! I need to take lessons from you in presentation. This looks gorgeous! OH, my goodness! This looks divine!! 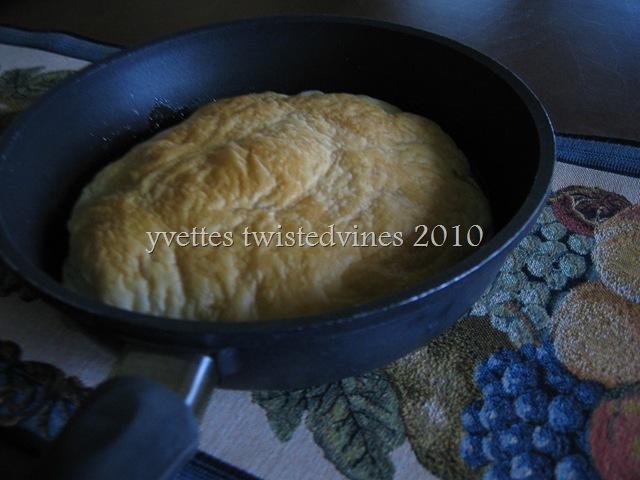 I like how it’s seems so quick and easy to make, especially since it uses puff pastry. It looks gorgeous with those glowing pears on top. Yvette that looks so tasty. A little macciato to go with it and chair over looking your vineyards perhaps? Lovely!